FlorenceForFun was established in 1999 by Federico Rossi as a company that promoted local nightlife to international students. In 2002, native Australian Anna McNiel joined FlorenceForFun, bringing an international perspective to the team. As the years progressed, FlorenceForFun began offering authentic Italian cooking classes, pizza-making classes and typical Tuscan dinners. In 2005, Fabio Paolini joined the team and FlorenceForFun officially moved into student travel. 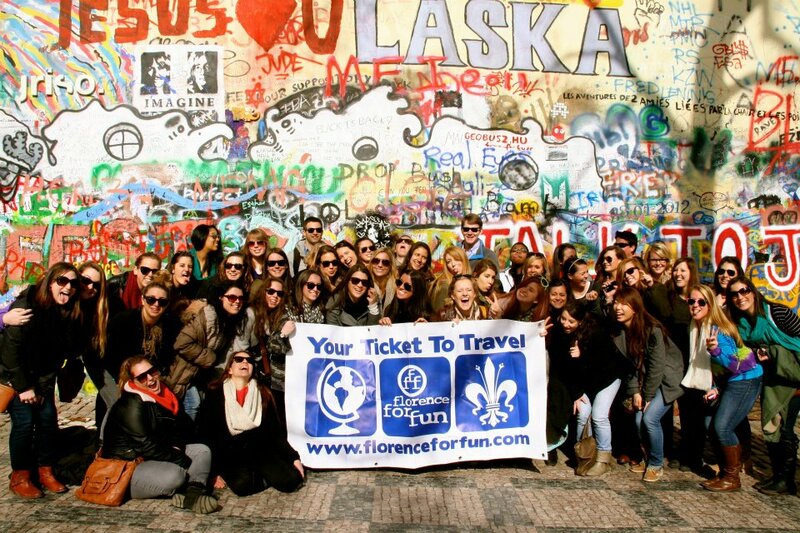 Today, FlorenceForFun is a travel agency that specializes in organizing days trips, weekends away and fall & spring break trips for study abroad students in Florence. FlorenceForFun has been working with students for a decade organizing events and travel. Let us do all the hard work and planning so you can focus on having another amazing weekend away. We specialize in student travel so our itineraries are designed specifically with your needs in mind; the most popular destinations • low prices • unique experiences • great value • door-to-door transport • knowledgeable, fun tour leaders. Explore Europe, discover Italy one day at a time, make the most out of living in Florence – you will remember this semester for the rest of your life. Visiting the John Lennon tribute wall in Prague, Czech Republic.